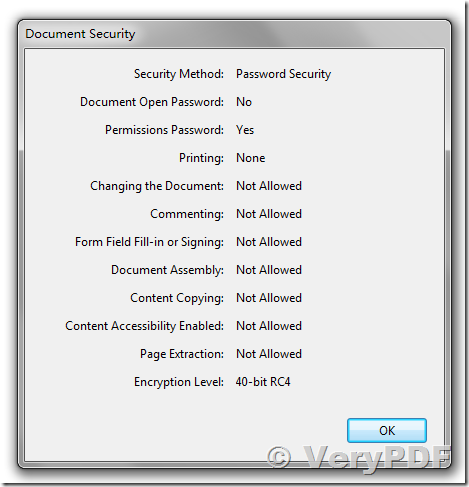 How to use doc2pdf.exe (docPrint Pro) Command Line to convert office files (DOC, DOCX, XLS, XLSX, PPT, PPTX, RTF, Text) to encrypted PDF files? Our company is looking for a third party API or command line which could be used for our project (automated encryption of several pdf files). We have found your product Document Converter which has command line features for conversion/encryption of various document formats. So we have downloaded the evaluation copy of Document Converter 6.0 and started to evaluate the command line tool doc2pdf. However the source file is existing. Then we tried the 5.0 version which evaluation copy was saved earlier. Interestingly there was some improvement: the conversion worked. However, unfortunately the encryption (which is our main goal) did not worked at all. We used the syntax found in the manual (doc2pdf -s openpwd=123 ...) the output file was created but without any encryption . Do we miss something, or is this feature disabled intentionally in the evaluation copy and is available only in the full purchased version? We would like to acquire a number of licences of the software but without ensuring that the functionality works we wont jump into the purchase. Could you please let us know how can we evaluate the command line encryption feature before the purchase? 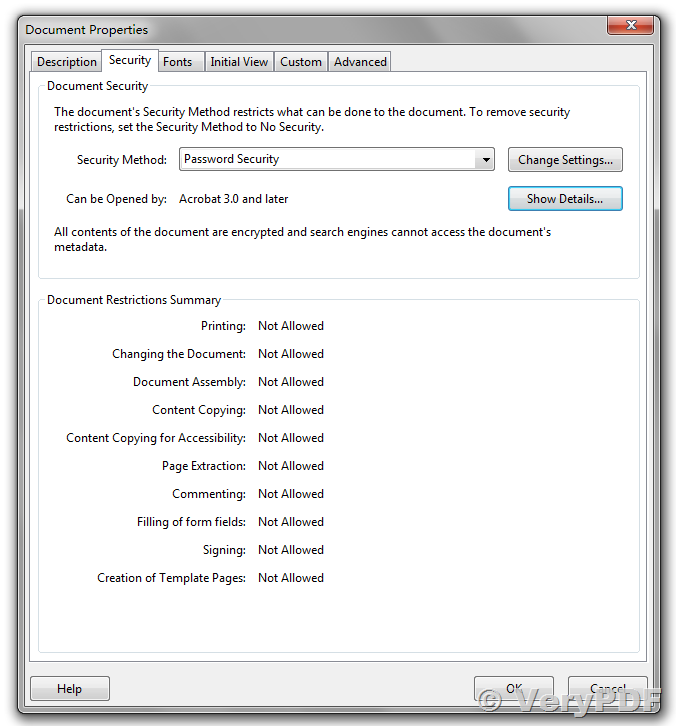 When I open the generated PDF file in Adobe Reader, I can see security settings in PDF file. Please run above command lines in your system to try, please feel free to let us know if you encounter any problem. 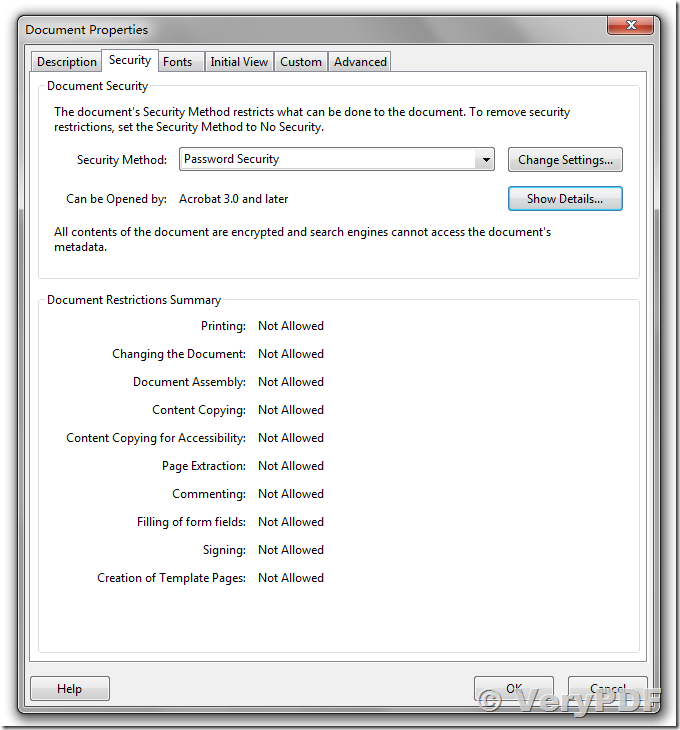 How to convert office files to PDF files from Coldfusion application? VeryPDF is able to read and parse MS Office DOC, DOCX, PPT, PPTX, XLS, XLSX, ODT, RTF formats without OpenOffice and MS Office installed. How to convert any file to PDF using PHP script? How can I change the location of page number in docPrint preview application? How to move a watermark on current page in the docPrint preview application? This entry was posted in docPrint Pro and tagged doc to pdf, docx to pdf, excel to pdf, Office to PDF, pdf security, PowerPoint to PDF, word to pdf. Bookmark the permalink.